Why My Mind Matters — Talk More. Tech Less. It's a New Year. Many are resetting their bodies, digestive systems, workout plans and personal organization. I'm resetting my mind. Trigger : something that serves as a stimulus and initiates a reaction or series of reactions. Ding. Click. Scroll. Our brains are trained to have triggers that call us back to our devices. I've taken a few weeks off of the interweb & social media posting to "rest" and "reset" my mind this holiday as well as giving my full attention to those in my life. The word reset means to "set anew'. In the context of our minds, doesn't that sound dreamy? It was a great break, but even with the time off, my mind was still so very active. My personality also makes it hard for my mind to rest - learning this is part of my spiritual growth. But there is a lot of recent brain science reporting that this technology age is not helping my mind rest. It's actually doing the opposite. This past year in the news many learned of the current dopamine labs created to literally change our brains to cause addiction to their apps, games and social media. Those users they're talking about are you, me, our kids, our society. While these tech companies develop mind altering technology many of them keep devices far away from their own children and even themselves because they know the effect it will have on their brains, their habits and eventually their lives. We've been studying and following, not only American, but the global tech giants: Apple, Amazon, Google, Facebook, Microsoft, The Alibaba Group and Tencent Holdings for a few years now. We learned years ago that many of these executives, including the creator of the iPhone, Steve Jobs, along with the creator of Twitter limited their kids and themselves on their devices. The very people building the technolgoy are now learning to set their own boundaries and some even regretting and recognizing what they have done to our society and world. Even with this knowledge, realizing the top Silicone Valley schools are raising low-tech kids in a high tech world, our public education systems are moving quickly to all electronics. Our restaurants are providing iPads for kids to play on while eating. Our culture is face down - tech-neck and all - behind our screens. We've been bringing awareness to this issue and creating products to help families unplug for a few years now. I do have a strong belief that awareness can bring change and 2017 did just that. For many the tide is changing and the truth is coming forward thanks to resent research, neuroscience and news outlets. What does all of this mean for us? What can the everyday person do in the shadow of these huge companies with all the allure they offer us and our families 24 hours a day? We can listen to the research. Boundaries for myself and my family do not mean we are weak, they mean we are smart. Looking at the facts about what this is doing for our mental health is key for setting good standards in our home and on our devices. As I look afresh at this year, 2018, and all its possibilities - I see a year of clarity. I need to step into a place of making space for a restful mind. What does that look like for me? Well, it looks like logging off and being human for a hot minute. First, I need to surrender my control and all the things I want to check off my lists. When I let go of that rigid grip I can quiet my mind enough to listen to what's important in this season of life. Second is realigning my boundaries. Where in my life have I strayed from them, from self-care, spiritual growth, family time, disciplines in my work/home/parenting, healthy boundaries in my technology use? Lastly, I can practice gratitude. When I do that I am present in this life I'm living and not looking for something to fill me, or fill my time. 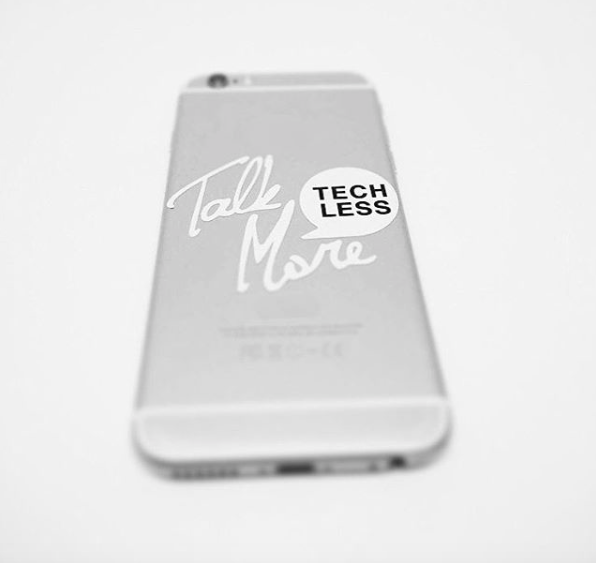 If you're seeking ways to reset or just opportunities to unplug, please check out the products we offer at talkmoretechless.com - from our very own Smartphone Ed. for first time smartphone users, to our little phone decals to help remember to flip your phone over and connect with those in the moment. Most of all, we hope you have a year of clarity. A year of mindful rest to listen and do what it is you were made for in this life!